Every now and then you get a band that can bring back a style with an updated vibe to peak your interest but with enough nostalgia to remind you why you fell in love with that music in the first place. 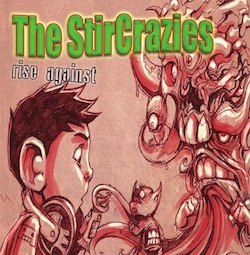 The Stircrazies do exactly that with their brand of surf-roots ska and reggae. The San Diego trio keeps things simple with drums, bass, guitar and vocals but manage to bring a full sound on their latest release “Rise Against.” Ok, they do get C-Money from Slightly Stoopid to rip some horn lines on the album, but it adds just the right amount of spice to the record! The album goes through several classic themes of punk, ska and roots reggae, with the band putting their personal touch on each element. The single from the album, “Relentless Love” is an enticing track blending the groups penchant for punk rock riffs with some steady reggae grooves and a rock-out chorus line. The band recently released a music video for the song, check it out on their website. I also really dug the title track from the album, another high energy blend of signature SoCal reggae and punk. The three-piece consists of Kali Kole on Lead guitar and vocals, B-Robb on bass and vocals, and Grizzly Al on the drums and vocals. I got a chance to catch up with the band and ask them a few questions, check out what they had to say and get to know these SoCal reggae-rockers! How does your name reflect the band's sound, or possibly vice versa? The Stircrazies is a great name because it really reflects the band’s different types of musical backgrounds and allows us to be creative using several genres . We love all different types of music, so everyone in the band enjoys changing it up and playing different stuff. Sometimes someone will say hey, let’s make a funk song or a dance hall type thing, or we will just thrash out a punk song, and the band rolls with it. We believe that music is the best medicine and great exercise for the soul. Plus, we love jumping around like psychos on stage during our high-energy live shows... so the name works really well for that. How did the group first get together? Was there a common music you all listened to? The group started with just a couple guitars and a love for writing songs. Kali Kole had this arsenal of rough recordings he had been working on since he was 18 (many of which turned into our first album), and the angst and emotional power behind them was just unbelievable; it’s like opening a teenager or young adult’s head and letting those emotions pour out into chord progressions. We just started taking those and reworking them over and over until they sounded tight to us. I saw you guys have C-Money from Slighty Stoopid on your record, what was it like working with him and do you normally incorporate horns in your live show? It was completely surreal; we are all long-time fans of Slightly Stoopid, those guys have been such a huge influence on both our music and genre as a whole. One day our friend Will Boyce caught wind that we were recording the album and said he would play C-Money some of the tracks we were working on and see if he was interested; next thing we knew the date was set. We all looked at each other and said dude... we got to get this right. C-Money came to our studio on a Saturday. He stepped in looking ready for a gig; suit, tie and trumpet in hand. He was honestly the coolest, kindest and easiest person to work with. After listening to the tracks a couple times with us and sort of just humming along, he said, “I think I got it.” He laid down the tracks pretty much straight through in a couple of amazing takes. We sat there with our jaws hitting the floor for a bit, then after finishing he was nice enough to hang out all afternoon with the band and some of our friends. It was a great experience seeing how he works and hearing some of his stories from the road. To be a fan and work with one of your favorite musicians, that is truly a blessing. Any other good/crazy stories from recording your album? Kali Kole Story: During the final tracking stage of our recording there was this beautifully chaotic moment. I was physically and mentally exhausted and laying down harmonies over some of the tracks after all the instruments were done being recorded. I was in the vocal booth connected through headphones to the sound engineer Matty in the next room and trying to come up with some melodies. There were like ten other people in the other room trying to help out, and I couldn’t for the life of me lay a decent track with them squawking like parrots in there. At this point we had been working on the album at SushiFish Recording Studios for about two months, and at the height of my delirium it hit me; we are almost done recording our first album... it is just one of those moments that I will never forget. B-Robb Story: I remember waking up late to a frantic phone call from Kali Kole the day we were recording with C-Money. He was talking urgently into the phone and said “Hey, make sure the fridge at the studio is stocked and pick up one of those veggie-dish trays so he has something to eat.” I’m sitting there thinking to myself that in an hour I’m going to be sitting in the same room with a member of Slightly Stoopid, and I have to show up with a vegetable tray looking like Martha Stewart with dreadlocks. Well, the veggie-tray ended up being a huge hit and C-Money was pulling broccoli out of his teeth before laying down his tracks. Touche, Kali Kole. What's next on the horizon for The Stircrazies? Lots of musical awesomeness. We have more new material to work on than we know what to do with, and every practice and show we are honing our skills and experiencing the wonderful and powerful cohesiveness that bands get to experience as they grow. This summer we will be featured in a professional live DVD with Proud Productions and laying down tracks for a second album. On top of that, the tour dates keep piling in and it is going to be awesome rocking the Unity Festival in northern California this September. Releasing our debut album last year was truly an awesome experience, and we can’t wait for the whole world to hear it. Every morning we wake up ready to eat, drink and piss music, and we couldn’t be more stoked on pushing this project as far as it will go.